Over in Colorado, those of science have created an artificial skin that can not only heal itself but also possess the same sense of touch we do. What differentiates us from our artificial counterparts? With continued advancements, arguably the primary thing that separates us is our five senses; the organic way we interact with the world. However, this month, a new self-healing electronic skin (e-skin) could see the line between AI and man blurred further. 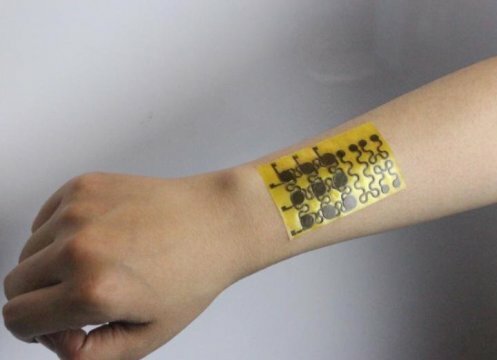 Developed by the University of Colorado, the “e-skin” is composed of a malleable and transparent covalent polymer (polyimine) which has been laced with silver nanoparticles for strength, conductivity, and chemical stability. This particular structure allows the polymer lattice to regenerate or “heal” itself. Due to the embedded sensors, it can also measure pressure, temperature, humidity, and air flow – completely mimicking the function and mechanics of human skin. The e-skin can also be applied to prosthetics and other biomedical devices. Something many amputees with artificial limbs currently find challenging is the concept of touch. Grasping a glass too hard with a mechanical arm means broken shards littering the floor, grasping too weakly means the glass will slip and shatter at one’s feet. With e-skin, amputees should be able to accurately grasp the object. Although various versions of this “skin” have been created since 2011, this version is groundbreaking as it is the first model to be fully recyclable and regenerative, solving the issue of electrical waste. One can’t help but feel that General AI – sentient Terminatoresque metahumans – will become the norm faster than anticipated. As exciting as it is, are we ready to destroy the boundaries between man, maker, and machine? TBS Likes ... is a strange place where anything goes. Like International Waters or Christmas morning after the shine has worn off and the booze has kicked in.